Most of the pictures below can be clicked for enlarged versions, and most of the images of documents are linked to a complete PDF. Pictures of artifacts are not to scale relative to each other. The Long Island Railroad (then the Long Island Rail Road) or LIRR was established in 1834 to create a rail connection between New York and Boston1 as well as to act as a potential first step in opening Long Island's pine barrens to settlement2. The hilly terrain east through Connecticut was considered impassible for a railroad, and it was believed that bridging the rivers along the way would block shipping3. As a result, a plan was devised to build a line via Long Island to connect with a ship that would have sailed from the North Fork to Stonington, CT. Finally, a train ride from Stonington would have brought passengers to Boston via Providence, RI.4 For a few years, the LIRR did actually run in this fashion5 and claimed the trip took as little as ten hours6. In the 19th century, the railroad had sleeping cars, which highlights what a trek a ride to Boston really would have been7. The LIRR first leased the Brooklyn and Jamaica Railroad Company's line running from the East River to Jamaica, Queens in 18368. At the outset, it had trouble paying, and its leadership was in turmoil9. From that point, it started building east through the center of Long Island. This route, meant to reach Boston by the most direct means, avoided the major settled areas such as Hempstead and the South Shore. Much of its right of way was uninhabited, so most residents had to make difficult treks to reach an isolated station.10 The railroad made it to Hicksville in 1837 and then as far east as Medford in Suffolk County in 1844. In the same year, the LIRR started building west from Greenport on the North Fork.11 While the railroad was pressed during those years to build a line along the South Shore, it never did so12. By 1850, a competing rail line was successfully completed through Connecticut, nullifying the LIRR's original purpose13, and all its service to Boston was terminated two years later14. As a result, it moved to transform itself into a local railway15, such as by building lines to Syosset in 1854 and Glen Head in 186416. However, its positioning opened the way for other competitors to build rival lines in more populated areas. One such operation was the South Side Railroad,17 which would bring the first rail service to Freeport. Please see the ARRT'S ARRCHIVES website for a South Side Railroad stock certificate facsimile. Village of Freeport. Freeport: Diamond Jubilee Seventy-Fifth Year 1892-1967. September 1967. In 1866, two crews, one starting in Freeport and the other in Jamaica, started grading the land for the new line, some of which was donated by local landowners. Several months later, additional crews started work further east.22In 1867, the South Side Railroad started laying track from Jamaica to Babylon, reaching Freeport before the year ended23. Freeport also got one of the first stations on the line, probably constructed during 1867 and 186824 and located at the intersection of Church and North Main Sts., a bit west of its current location25. In the late 1860s, the line had made it as far as Patchogue, and it was completed at a cost of $20,000 per mile26. 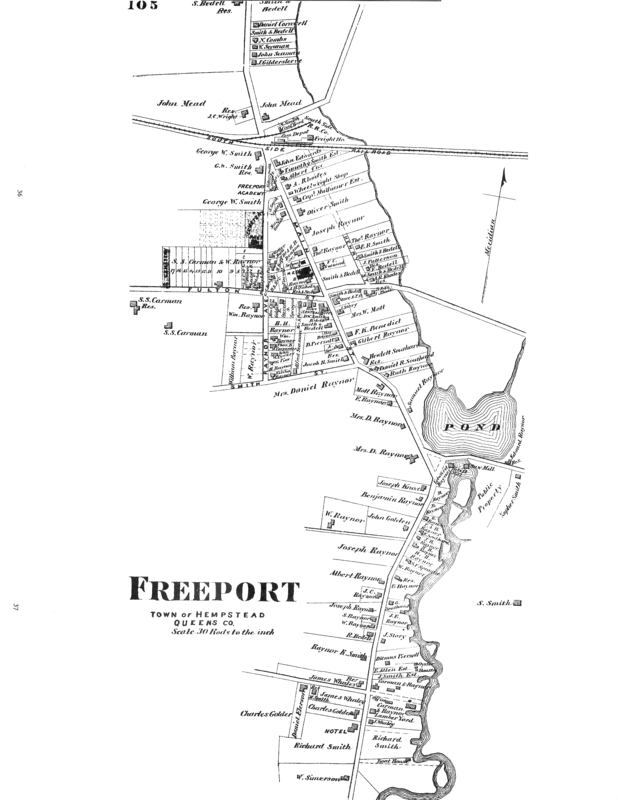 A facsimile of a 19th century map of Freeport is shown above, including the South Side Railroad's path through it. The line apparently also included a spur to a coal yard that stood north of the station. When trains started running in 1867, a huge crowd turned out to meet the first one arriving in Freeport to the sound of beating drums, and the train went through with its bells ringing27. At that time, the fare from New York to Jamaica, for instance, was 18 cents, though free passes were given to the clergy28. 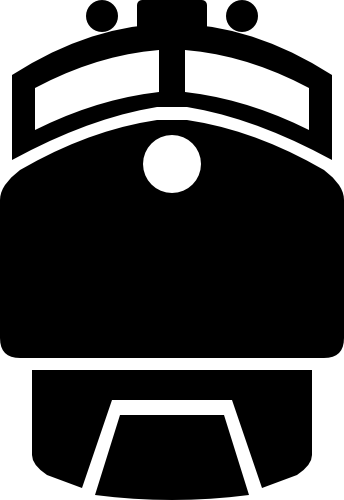 The South Side Railroad's locomotives were named after the various destinations it served, though none seem to have been named after Freeport29. In 1867, the railroad also started building west of Jamaica30, and being denied access closer to Manhattan, it ultimately terminated in Williamsburg, Brooklyn. It used horse cars and later small locomotives called steam dummies to reach the ferries to Manhattan on the East River31, though the railroad later did get closer access32. Unlike the LIRR34, trains were not run on Sundays in observance of the Sabbath, though there was speculation that the real reason was to keep outsiders off the beaches of the Rockaways35 after the line was completed from Valley Stream. Please see the ARRT'S ARRCHIVES website for South Side Railroad timetable facsimiles (located about 1/3 down the page). 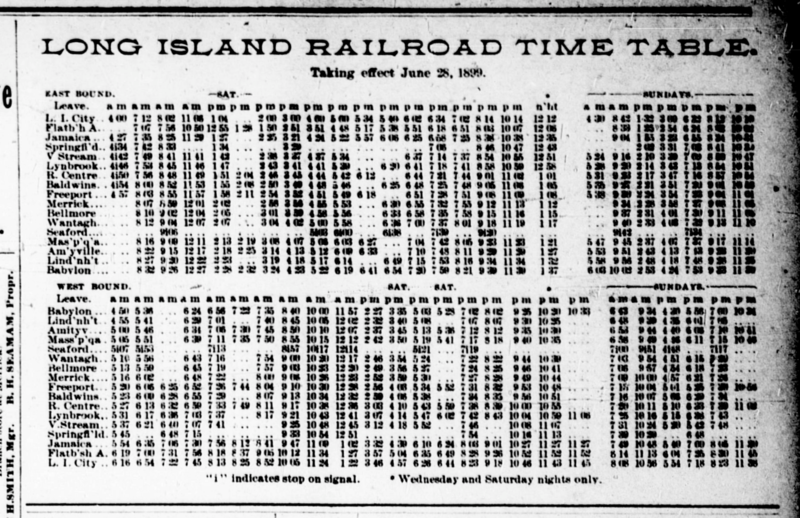 According to the 1869 timetables above, Freeport had only six trains per day in the early years of the South Side Railroad. Aside from passenger travel, the LIRR controlled mail transport by rail, and it took until 1869 for the South Side Railroad to get mail contracts for the South Shore36. As of the 1950s, mail was still being carried on the Babylon Branch, and in 1953, it started being collected earlier in Freeport so it could make it on the 9:00 train and get out earlier37. 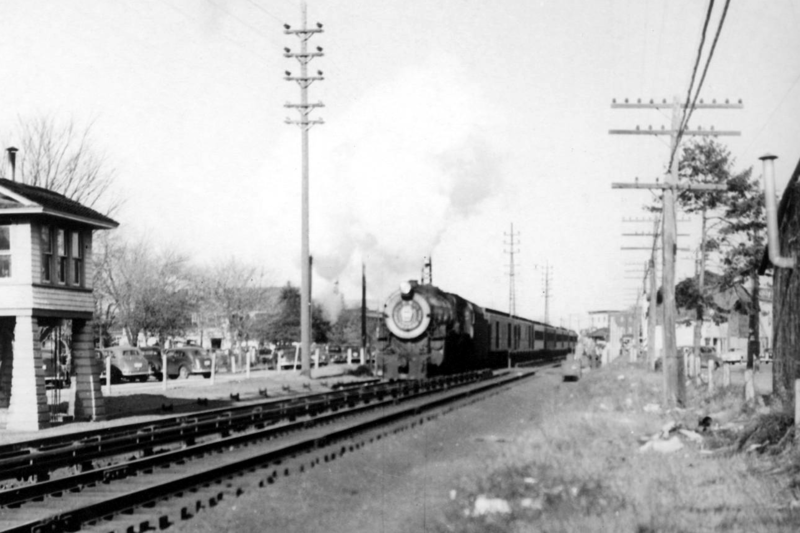 The South Side Railroad was built to better standards than the Long Island Railroad, being newer and having access to more modern technology38. 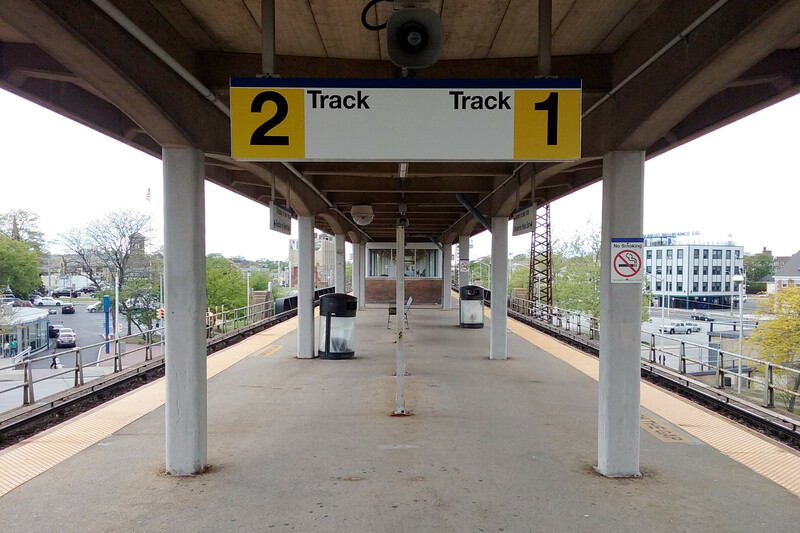 Like the LIRR, however, it was initially just a single track, though it started adding a second track to the whole system in 187039. It also set a speed record of 70 mph for train service on Long Island the same year40. In 1871, however, a serious accident occurred on the approach to Freeport from Merrick, in which three cars derailed due to track damage, and several people were injured41. In the following summer, the South Side Railroad experienced its first fatal accident, in which three passengers were killed42. In Brooklyn, the railroad was also forced to get rid of its steam dummies in 1875 after a number of accidents involving children playing around them43. The railroad initially used telegraphs and watchtowers to signal and monitor the positions of trains. In 1868, the South Side Railroad installed a telegraph system for dispatching trains44. Freeport's call sign was FY, and later, it was changed to PORT45. Earlier on, traffic was controlled from a series of towers along the lines46. Freeport's tower was replaced at least once, and the latest one was torn down in 196047, most likely as part of the grade elimination project taking place at that time. The South Side Railroad started to become overextended financially by the 1870s and underwent restructuring. Nevertheless, its finances were still in trouble, and one of its trains was even impounded when it arrived in Hempstead. In a final burst of vigor, it started grading the land for new facilities in Hempstead, the construction almost reaching into Uniondale, when the Panic of 1873 hit. One of the banks affected owned the South Side Railroad at that time, and the railroad wound up in receivership; it was ultimately auctioned off in 187448. Service continued on, though a major accident that killed nine people, in part due to poor maintenance, forced the railroad to refurbish its infrastructure49. Rail service on Long Island started to become redundant and exceed demand, and the amount of competition made it impossible for the the railroads to stay afloat financially50. Of Long Island's competing railroads, the LIRR was in the best shape by 187551. The South Side Railroad, meanwhile, was foreclosed on and reestablished under a new corporation. In 1876, The LIRR leased the South Side Railroad, along with another competitor, the North Side Rail Road, after over-competition had driven the revenues of all three through the floor52, forming a unified system53. The LIRR was in receivership itself, however, by the following year, and for a time, the South Side Railroad was severed from it54. Toward the end of its life, the South Side Railroad was also renamed the Southern Railroad55. After further reorganization, the Southern Railroad became the Montauk Division of the LIRR56. As of the 1940s, the line on which Freeport is situated was still called the Montauk Division57, rather than the Babylon Branch, the name used today. 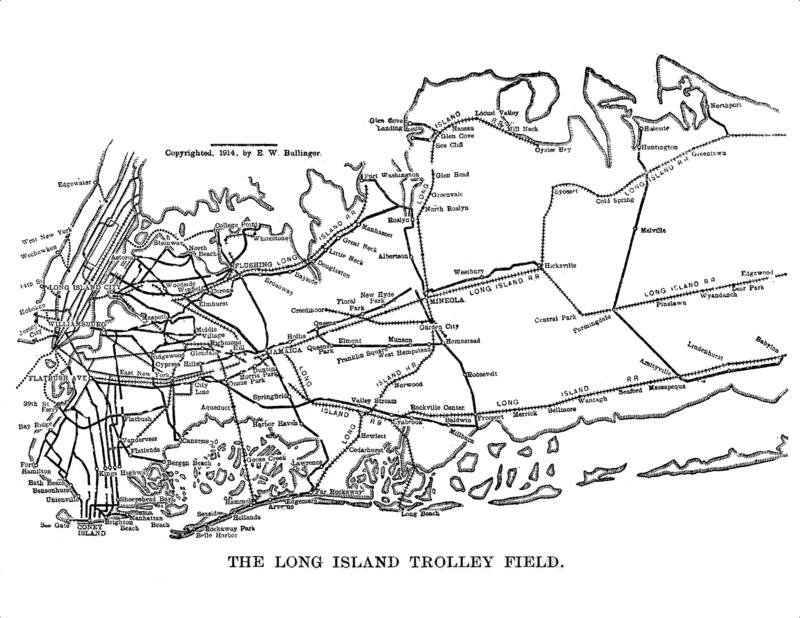 By the 1890s, all train service on Long Island was being provided by a unified system under the LIRR58. In 1898, during a whistle-stop tour, Theodore Roosevelt made a brief stop in Freeport and gave a speech at the station60. 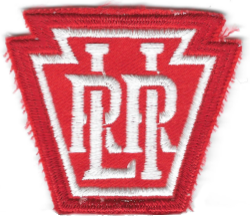 Looking to become the operator of a major regional rail hub, the Pennsylvania Railroad bought out the LIRR in 190161. As of 1920, the latter still seemed to have some degree of autonomy and paid rent to the Pennsylvania Railroad62. The latter spent millions of dollars on improvements63 and built Penn Station, the Sunnyside Yards, and tunneled under the East River, among other projects such as grade eliminations64. Artifacts from the Pennsylvania Railroad's control of the LIRR can be seen above. These include a uniform patch (left) featuring the logo from that period and tickets from the 1920s (center) and 1940s (right), which respectively are much larger and smaller than the standard tickets used today. 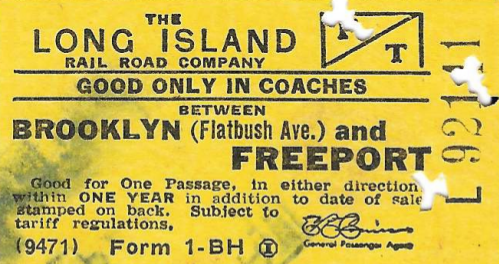 Additionally, below, is a Long Island Rail Road Placement Card from 1956, which would have been used to log the location, physical characteristics, and other information about a freight car. The LIRR and the New York and Long Island Transit Co., which provided most of Freeport's trolley service, were fierce rivals. The LIRR repeatedly cut the N.Y. & L.I.T. 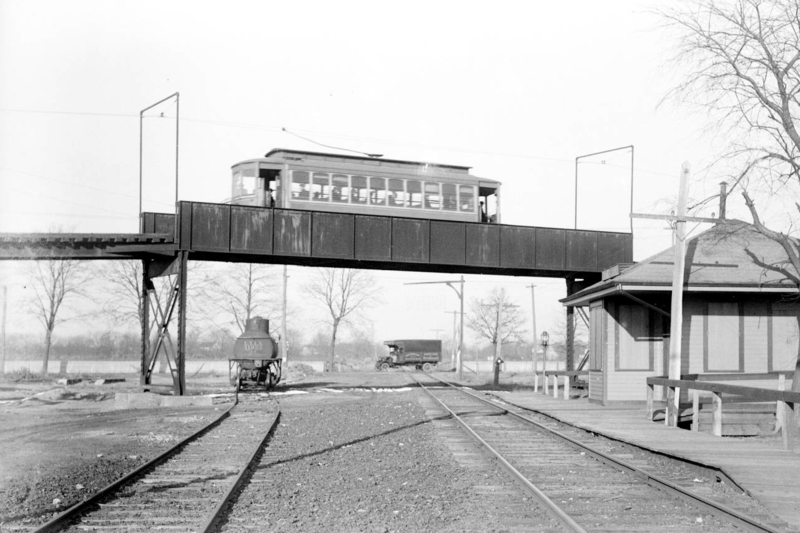 Co.'s trolley wires where the crossing of the latter's Mineola–Freeport line was to be constructed65. By the summer of 1902, the N.Y. & L.I.T. Co. was applying for an injunction to stop the LIRR from cutting the wires while the LIRR was trying to get an injunction to prevent the trolley from crossing its tracks66. In the end, the two companies agreed to jointly fund an elevated crossing67, which is shown in the picture above. Milburn can be seen at the lower center. A community called Milburn used to exist between Freeport and Baldwin, though it did not survive the rise of the railroads. It had initially developed as a shipping hub, but after water began to be piped from the area to serve Brooklyn, the water level of Milburn Creek dropped and was no longer as readily navigable. In addition, thanks to the rise of the Long Island and South Side Railroads, many goods began to be carried by freight train instead. As Milburn declined, it was ultimately carved up between Freeport and Baldwin in 189268. However, it was apparently still considered a separate hamlet as late as the 1910s as suggested by its inclusion on the 1914 trolley map above. Today, it survives in name around the Freeport-Baldwin border at Milburn Ave., Milburn Ct. (one in Freeport and one in Baldwin), Milburn Creek, and Milburn Pond. By the turn of the 20th century, electrification had become of serious interest to the railroads, and major electrification projects had commenced. Electric offers smoother, quieter service and eliminates train emissions but is also costly to install and can pose an electrocution hazard to people near the track. The LIRR started to be electrified in 1904 in the west, and electric service was running by 190570. 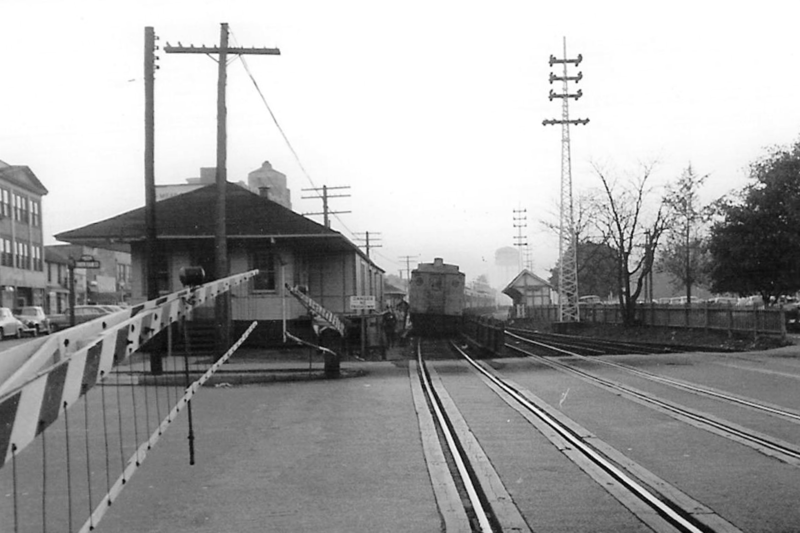 In 1906, an electrified third rail was installed on from Valley Stream to Springfield Junction in Queens71. 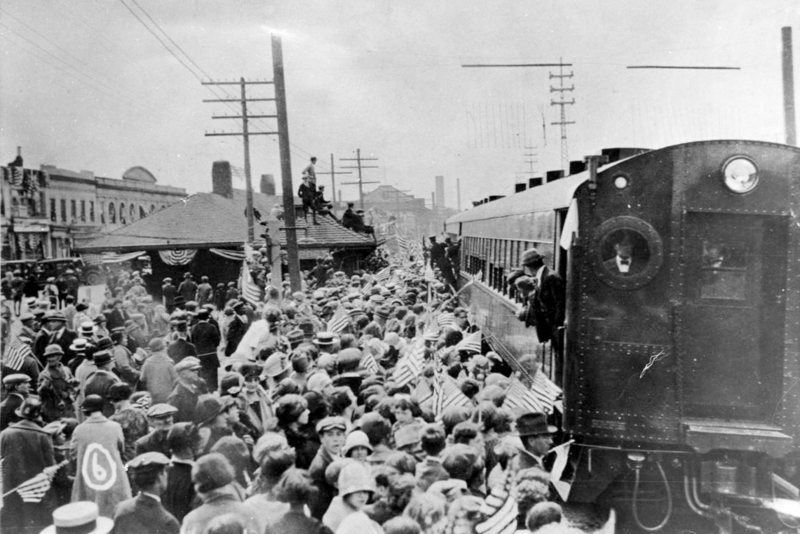 Electrification came to Freeport in 1924, the photo above showing the fanfare that greeted the first electric train to arrive in the village. By 1934, about half of the railroad's trackage was electrified72. 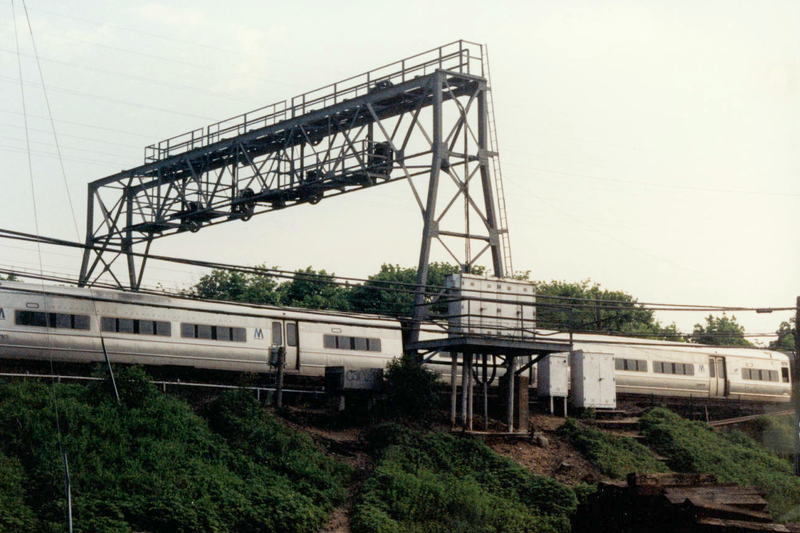 The LIRR's original main line had only been electrified up to Hicksville until 1988, when electric service made it to Ronkonkoma; previously only diesel service had been available east of Hicksville73. Otherwise, currently, the entire Hempstead, West Hempstead, Far Rockaway, Port Washington, and Long Beach Branches are electrified. The Babylon Branch is electrified as well, though the adjoining Montauk Branch is not. The Port Jefferson Branch is only electrified to Huntington, while the Oyster Bay Branch only is for one stop, to East Williston.74 As a result, the LIRR still runs a significant amount of diesel service. Steam service, on the other hand, formally ended on the LIRR on October 8, 1955 with a final ride from Jamaica to Hicksville, where diesel trains arrived from Riverhead ceremonially took over75 Above, a steam train departs from Freeport station. In the foreground, part of the station's watchtower is visible. Please see the GenDisasters website for photos from the LIRR Accident at Richmond Hill (the one discussed below is third from the left). The worst accident in the history of the Long Island Railroad took place on November 22, 1950. 78 passengers were killed in an accident at Richmond Hill, Queens when a train stuck on the tracks was slammed by another train from Penn Station.76 In the photo of the aftermath above, a car of one of the trains can be seen buried in a car of the other. As the population of Long Island increased in the 1900s, LIRR tickets sales did as well. In June of 1909, 523 tickets were sold at Freeport station, and in June 1910, 610 were sold79. By 1920, Freeport had the fourth largest number of commuters in the system80. By 1981, it was still one of the busiest, with 2,800 passengers boarding at Freeport during rush hour. Around 1914, a typical Freeport taxi fare charged by the cabs that herded around the station was $0.25. Amid accusations of price gouging against the cabs, one driver went down to $0.15 for a ride anywhere within the village.81 Taxis were actually banned from the station for a time in the early 1940s82. 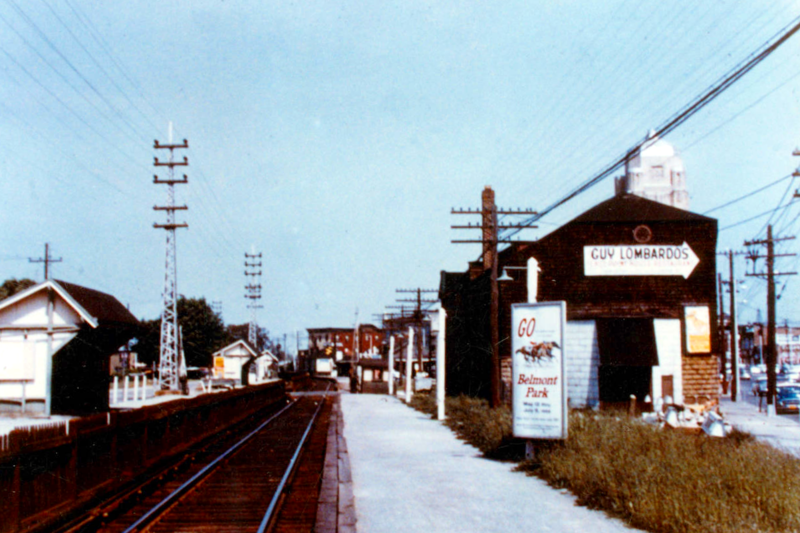 Until relatively recently, Long Island Railroad trains served a greater variety of locations, not just passenger stations, with private spurs reaching out to facilities such as factories and hospitals83. Today the facility has two tracks leading in from the main Babylon Branch and is an MTA facility for servicing the railroad's electrical infrastructure. The tracks off the main Babylon Branch are visible in the lower center. The freight station itself is in the background on the right. To the left appears to be an electrical substation, which converts power from the grid for use by the railroad, and accompanying transmission lines. 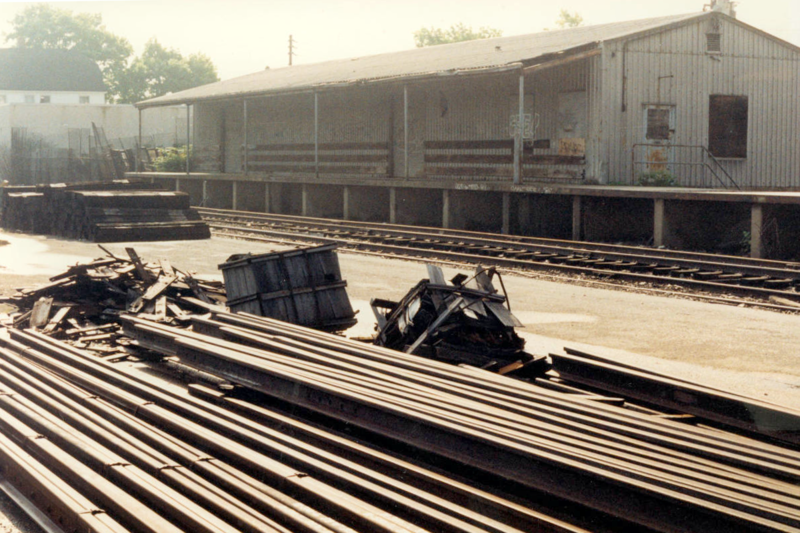 While the freight station itself still stands, the additional line that served the private industrial facilities no longer exists. This 1988 photo shows the gantry probably near the freight station from the north. Such a structure can be used to support signals or cranes to service the cars below. The original MTA logo is visible on the train passing beneath. 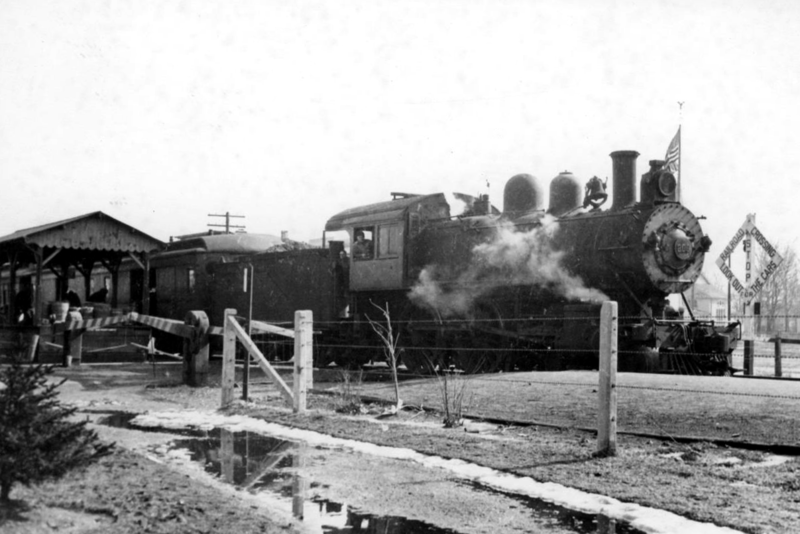 The Long Island Railroad's grade crossings were a major source of its accidents. Over the years, there were terrible collisions between trains and automobiles, wagons, and pedestrians. This was especially the case in a busy area such as Freeport85, which alone had seven crossings86. By 1950, 100 trains ran through Freeport daily, and the crossing gates were down almost as often as they were up87. On the right side of the pre-diesel photo above, a sign is visible warning of the potential danger at the crossing. Mixing the swiftness of the train with that of the increasingly common automobile had taken the carnage to a new level by the 1910s88. At that time, crossings were not automated as today but manually operated by an attendant89, an example of such a crossing shown in the photo above. A "Danger No Trespassing" sign is also visible just after the crossing, and a fence separates the east and westbound tracks to prevent people from crossing them. Similar to how the trolley companies wet the roads to suppress dust, the Long Island Railroad put down oil at its grade crossings in Freeport to keep the dust down90. 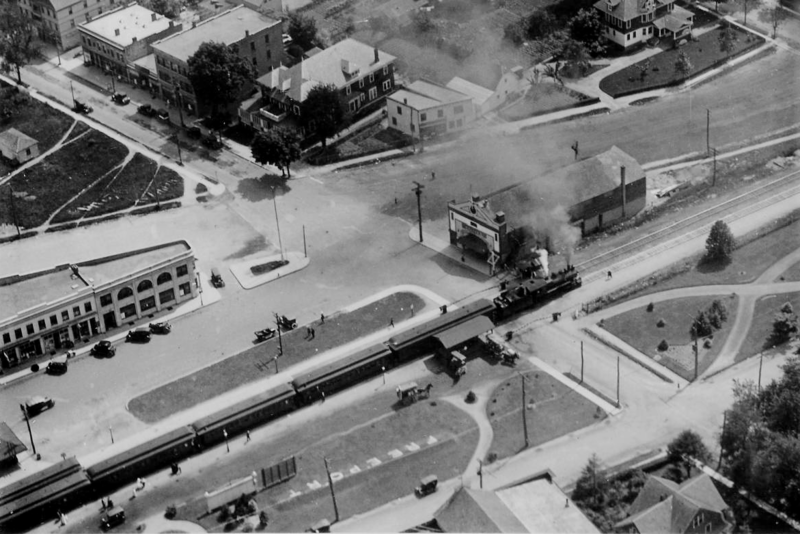 As late as 1912, the grade crossing at Ocean Ave. had no gates at all and was the only unregulated crossing in Freeport. In that year, it was the site of an accident that killed two people91. In the space of a month in 1914, there were five incidents where cars hit or were hit by trains after ignoring a watchman92. 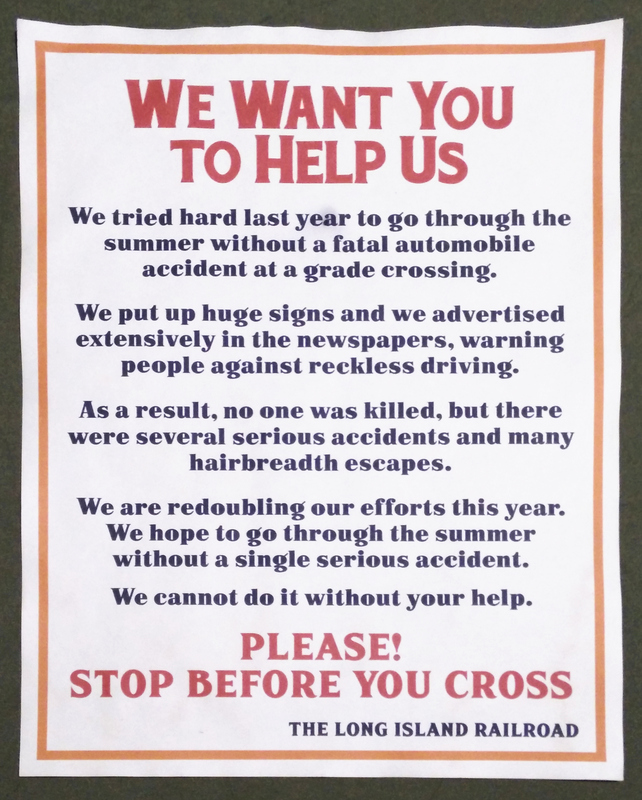 In that year, the railroad also took a lot of criticism for declining to participate in a grade crossing safety initiative being launched by Freeport civic organizations, citing lack of funds93. Not long after, however, it was stepping up its own campaigns94. There was a fatal accident on the tracks in Freeport as recently as 201695. SVG file of poster graphics also available. (see the article "Ask Co-Operation" on the upper middle of the page). In 1916, the LIRR distributed this somewhat ominous poster as part of a public service campaign to address the epidemic of accidents between cars and trains at grade crossings. Here, the poster is recreated approximately based on a description of it printed in The Nassau Post in May of 1916. These kinds of initiatives, however, can only be considered a stop-gap solution as they do not address the actual problem of having rail and other traffic operating on the same level. Ultimately, the state set aside money for eliminating many grade crossings throughout its rail network96. The Cohen Plan or the Midtown Plan? 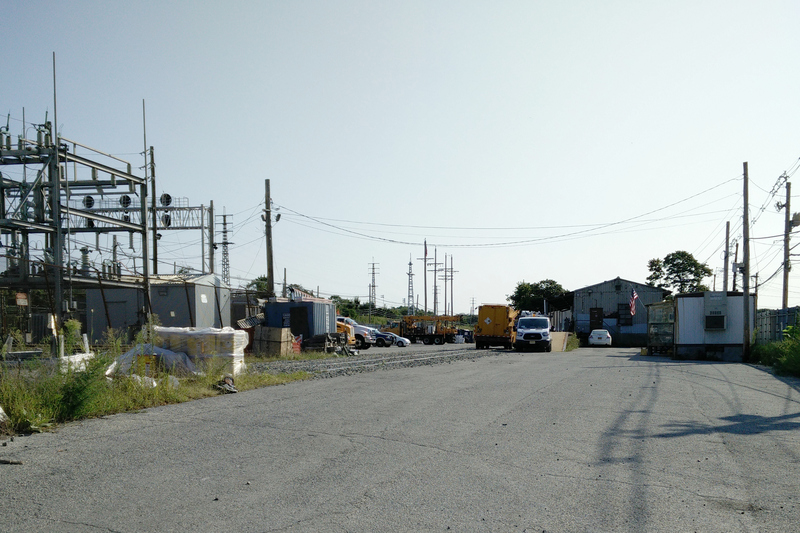 There were two major competing plans to handle the LIRR grade crossing eliminations in Freeport. The older of the two, adopted in 193797, was officially called the Ordered Plan98 but popularly known as the Cohen Plan after its architect, A. Burton Cohen99. It entailed only raising the tracks without doing any redevelopment to the surrounding area100. 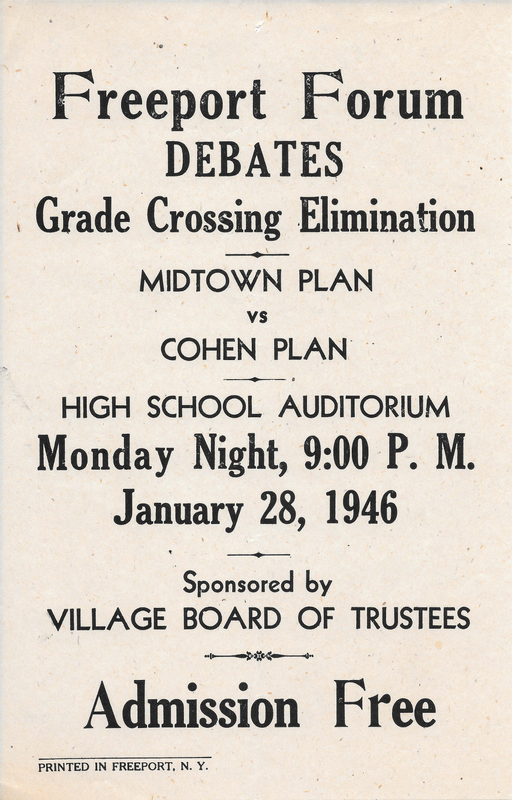 The grade eliminations were put on hold due to World War II, but as the war ended, and they were again being considered, the rival Midtown Plan emerged, formulated by H.A. Strecker101, named such because the project concerned the middle of Freeport102. It focused on reworking the parking for the station and the traffic flow around it. 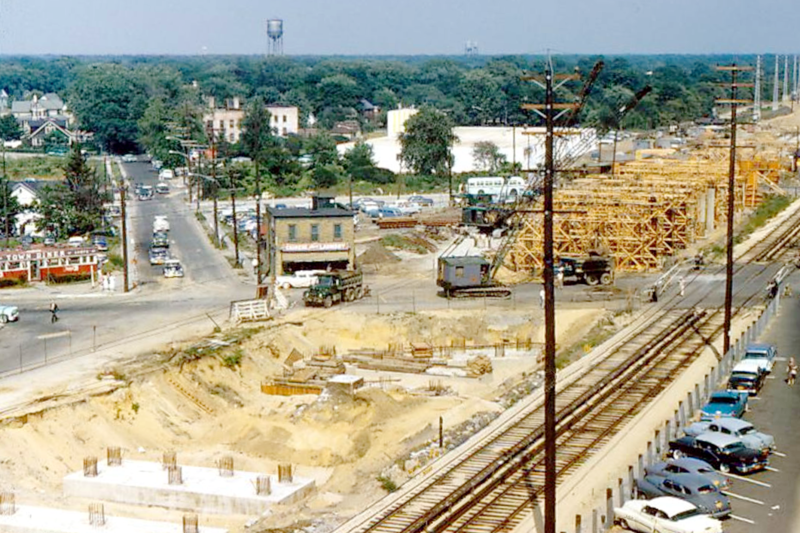 Under the Midtown Plan, the trestle was to be built out of steel103. The passenger station, meanwhile, was to be combined with the taxi stand and bus terminal104, while the train and bus would share a ticket office105. 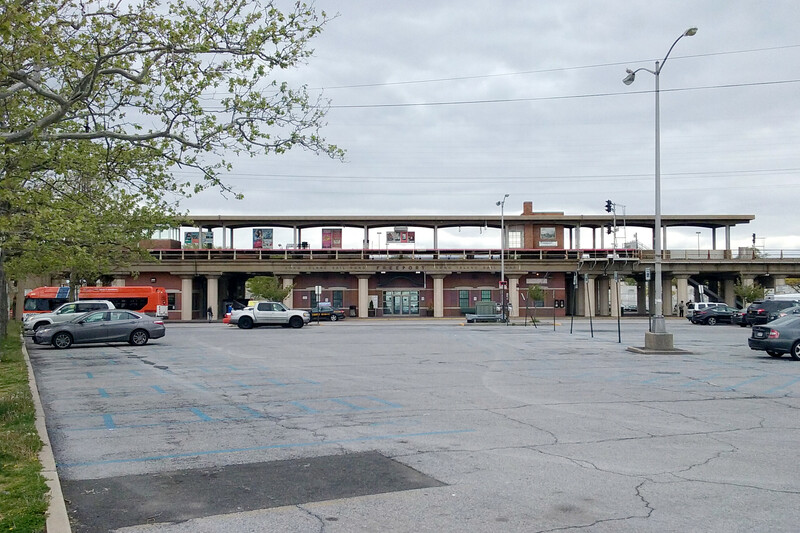 The plan also called for the station to be moved over 1,000 feet east106, and the freight station, which would have been in the way, was to be relocated107. The area around the freight station was deemed a slum, and moving the station was supposedly going to correct this108, that is, everything would be knocked down and replaced with a train station. One writer for The Leader, moreover, advocated demolishing "unsightly structures to establish a parking plaza"109. 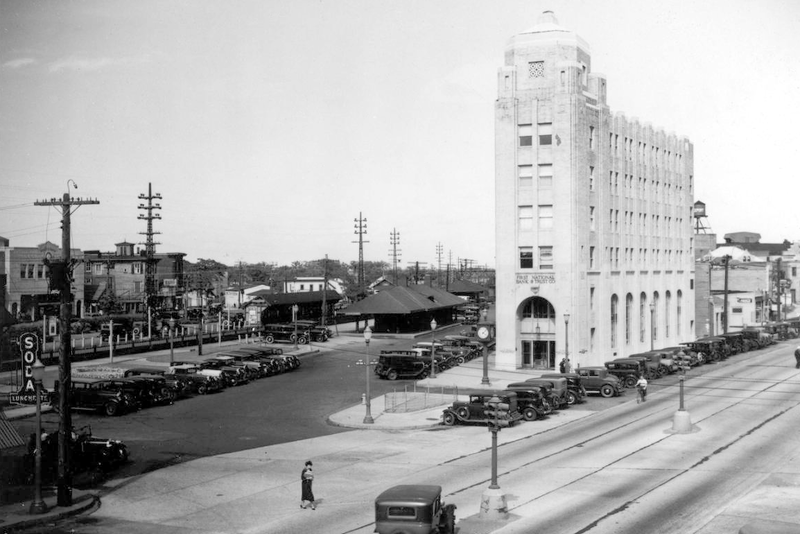 The Midtown Plan called for parking for 1,000 cars, which would have been broken up by a small park, in addition to lengthening and widening surrounding roads110. The Cohen Plan entailed elevating the tracks using an embankment and concrete trestle, though trains would have continued to run at ground level east of Main St111. The station and ticket office were to stay in their original location between Grove and Main Sts.112. 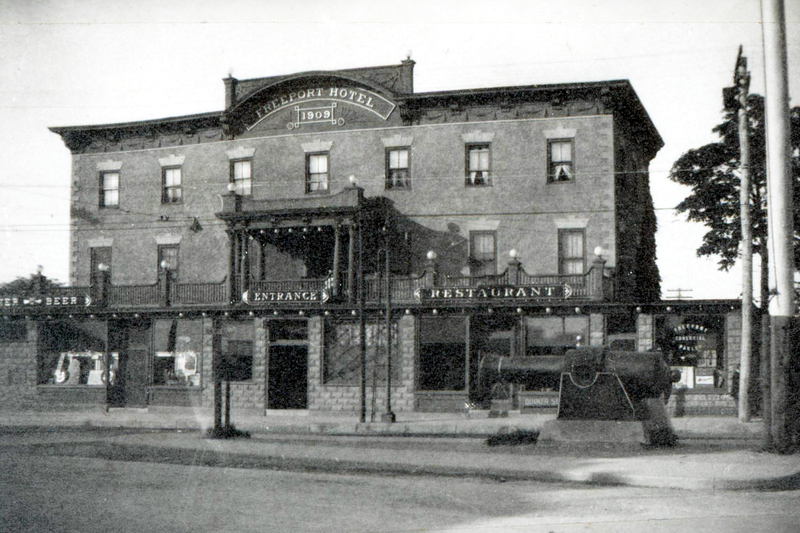 The bus terminal, then located on Henry St., would have been left alone113. The plan also provided for train storage114. The issue of how to do the grade elimination was marked by spirited debate116. Larry Andrews of The Nassau Daily Review Star observed, for example, that "Freeport residents are split three ways amid a verbarl [sic] storm of rumor, criticism and partisanship involving the Village Board, Chamber of Commerce and civic associations"117. The flyer above announces a public debate on the grade crossing question. On the one side, proponents of the Midtown Plan argued that Cohen's proposal was outdated even before it could begin to be implemented118. Civic groups and business associations opposed the plan since, they said, the situation changed; Freeport had been built up significantly, and its population had dramatically increased119. The village said that a lack of parking at the station would result in commuters parking on the street and cause major disruptions in the area120. On the other side, supporters of the Cohen plan were concerned about the longer walk for some commuters to the station, more commuters being forced to cross Main St., and the cost of the parking lot123. Meanwhile, the Long Island Railroad was filing for bankruptcy, and up to 15% of the drawings for the Cohen Plan had already been completed.124. In one report made to the Village Board, the Midtown Plan was lambasted for its additional costs125. 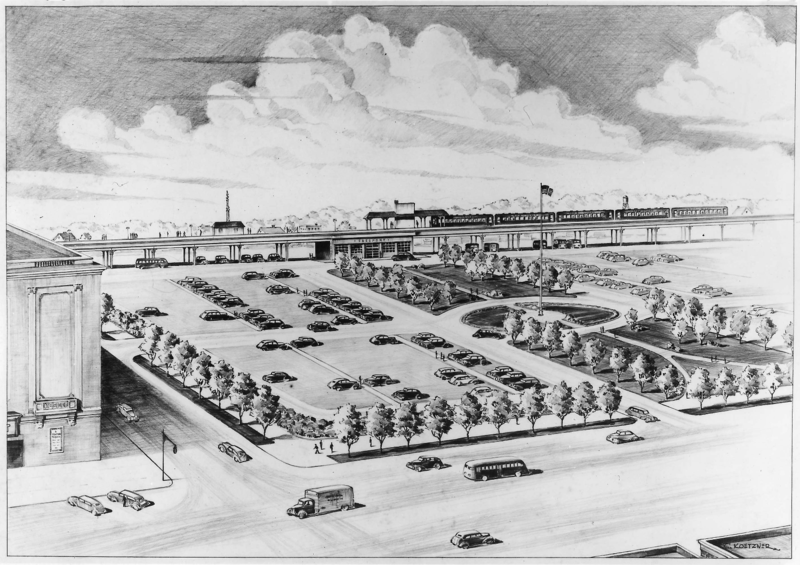 By the late 1940s, as the matter was being reconsidered by the Public Service Commission, the Midtown Plan was supplanted by a modified version called Plan No. 3, which was more modest and perhaps seen as more likely to get approved, put forward by a coalition of Freeport civic organizations131. Aside from elevating the tracks, it still put a bus terminal underneath as well as a ticket office east of Henry St. Parking was to be reduced to a 600-car lot with additional parking scattered around the area132. It still called for the station to be moved but only 750 feet133, though this still had it extending into the freight yard134. Going forward, Strecker backed this plan in place of the original Midtown Plan135. To help pay for the grade elimination project, Freeport was expecting state and federal funding set aside to aid post-war development136. Even though the grade elimination plan had been put in place years before World War II began, as the war ended, local officials recast it as a postwar economic development project137, perhaps with an eye toward these funds. The core issue was whether to only do the grade eliminations or to make them part of a larger improvement project. As far as whether grade elimination funding should go toward the other improvements, both the Long Island Railroad and New York Dept. of Public Works argued they were incidental to it138. Regarding how to raise funds on top of what was provided from the state and federal government, one possibility raised was to issue bonds139. Another was legislation proposed in the state assembly for $35,000,000 in funds for grade eliminations140. Also looming was the possibility of raising village taxes141. Original hearings regarding the grade eliminations were held by the Public Service Commission from 1932 to 1937142 and resulted in the Cohen Plan being approved. When the project started back up at the end of the war, the Village Board, pushing for the Midtown Plan, began petitioning in 1946 for the matter to be reopened143. The Commission did reopen public hearings in 1949144, and they ended by January of 1950145. During the hearings, a major potential issue with the Cohen Plan was brought to light, which was a boost to the cause of its opponents. According to an LIRR engineer, rebuilding the station where the original one stood would require an additional steel structure to protect the Brooklyn Water Works pipeline that ran alongside it146. It would take years for the construction to actually get underway. In 1958, bidding to build the trestle through Freeport was being conducted, with the low bid just under $6,000,000147. Construction wasn't completed until the 1960s148. In the foreground of the photo above, the concrete foundations for the trestle with their exposed steel reinforcement to tie into the columns are in place, and further back is wooden formwork for pouring the columns. Temporary tracks allowing train service to continue are to the right. 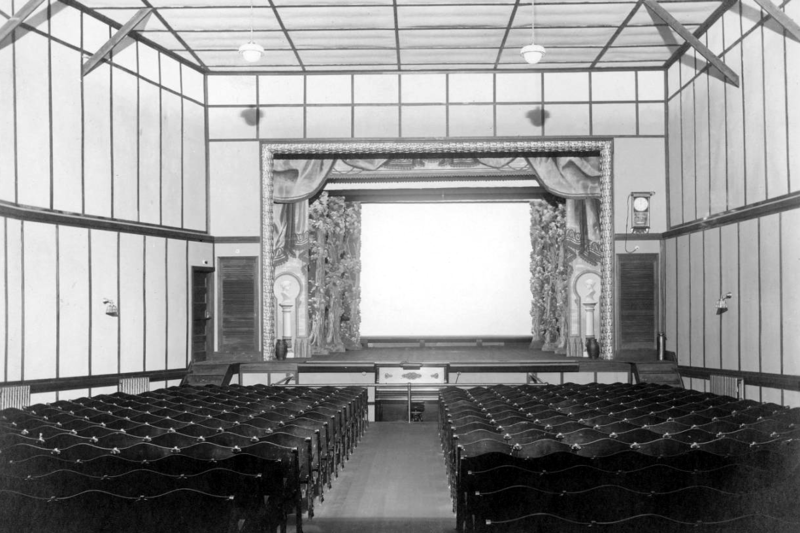 Fifteen buildings had to be demolished to make way for the grade eliminations, notable structures including the Plaza Theater, the interior shown in the second image above, and the Freeport Hotel149, shown in the first image well before the grade eliminations got underway. Trolley wires are visible across the front of the hotel. The above rendering shows what the full Midtown Plan would have looked like150. The most notable differences in appearance between this depiction and what was actually built are the more slender steel structure and the small park breaking up the parking lot. In the end, the station was moved151, but not as far as originally called for; the west end of the platform wound up where the original station was. The structure also was built out of concrete rather than steel. Moreover, most of the Midtown Plan's proposed changes to the roads surrounding the train station were never made152. The Midtown Plan proponents did not get all the parking they wanted or a new bus terminal153. The photos above show the original station shortly before it was replaced. The first photo shows the ticket office and waiting room from the west. The second photo shows the station also from the west, looking down the platform from further back, and in the background, the top of the Meadowbrook Bank Building is visible. The final results of the grade eliminations are shown above, the north side of the station on May 26, 2017 in the first photo, the south side on May 7, 2017 in the middle, and the platforms looking west on May 7, 2017 in the last photo. Note that the eastbound train is on the westbound track, which was due to ties being replaced. As for the entire stretch of elevated track through the village, going from west to east, an embankment runs from Milburn Ave. in Baldwin to N. Grove St. in Freeport with bridges in Freeport over S. Bayview Ave., N. Long Beach Ave., N. Bergen Pl., and N. Ocean Ave. The trestle then runs from N. Grove St. to Benson Pl., crossing those roads as well as N. Main St. and Henry St. Another embankment continues on from there with no additional bridges in Freeport, going under the Meadowbrook Pkwy. at the village line until the west end of the parking field of the Merrick train station. During the 60s, 70s, and 80s, the Long Island Railroad, and mass transit in much of the country, went through a period of general malaise and decay. This is evident, for instance, in the large dip in the frequency of service to Freeport for that era as seen in the chart above. Expanding suburban sprawl, which is less amenable to mass transit than higher-density development, and the resulting diversion of transportation funds to automobile infrastructure can be seen as major causes. The dramatic expansion of automobile use after World War II also caused a cultural shift away from mass transit, emphasizing personal vehicle ownership. This, however, does not mean there was no attempt at improvement and expansion. In 1963, for instance, there was a proposal bring the Long Island Railroad to East Meadow and Levittown and to connect them to Babylon via the Ronkonkoma/Babylon Branch156. Additionally, in 1989, Nassau County bought a 20-mile-long strip of land along the Babylon Branch that previously had been the right-of-way for the Brooklyn Water Works' pipeline. To prevent it from being used for commercial buildings, it was turned over to the villages along the way, who were given the option to use it as parks or parking lots. Freeport got 15 plots, five of which already were being used as parking.157 The right of way for the pipe was located north of the tracks158, the bottom of the photo above, which probably dates to the 1920s. The Plaza Theater, later demolished for the grade eliminations, is visible next to the locomotive. 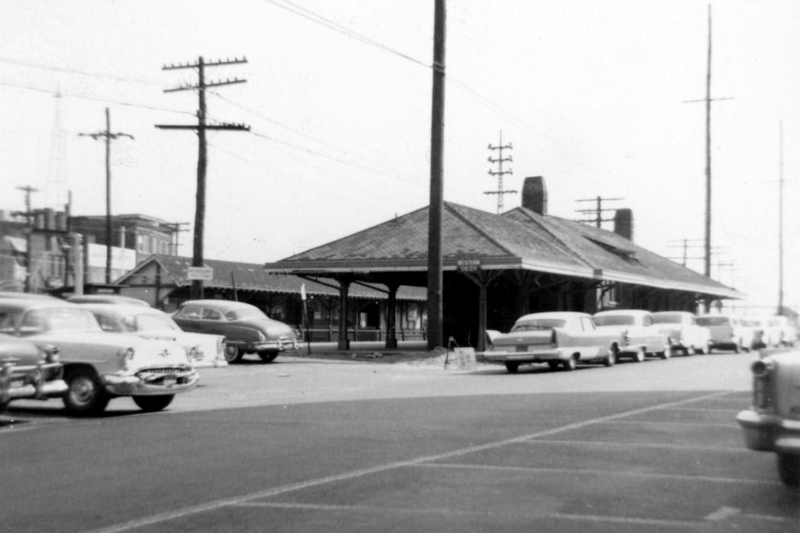 From about the late 1970s to about the early 1990s, there was a significant spike in crime that affected the Freeport train station. This included episodes of assault159, drug-related crime160, larceny161, robbery162, and vandalism163. As the economy slowed down after the boom of the 1980s, the LIRR planned to eliminate 60 trains per day system-wide. Freeport lost about five trains.164 Further cuts affecting Freeport were made a year later, the LIRR citing declining ridership165, amid a great deal of controversy166. The LIRR workers went on strike in 1994, putting much more pressure on bus service, though it apparently did suffice for the duration of the strike167. The crime issue had gotten serious attention by the early 1980s as its detrimental effects on the village and other locales had become obvious168. During and since that period, there have been several initiatives by village, town, and county officials for improvement, such as renovations to the station in 1981169; a protest by the County Executive to the MTA about the condition of Freeport and other Nassau stations in the end of that year170; an anti-graffiti initiative in 1982171; the construction of a new waiting room, ticket office, and restrooms in 2001172; a general cleanup in 2009173; and the replacement of antiquated escalators in 2012 at Freeport and other stations after a woman was killed in an escalator accident on the east end of the Babylon Branch at the Lindenhurst station174. In 2002, new building projects commenced in downtown Freeport as part of a general attempt at revitalization; the decline of local boat building industry, for one thing, had caused a general decline in commerce. Right by the train station, this was supposed to include the restoration of the Meadowbrook Bank Building, which used to be the tallest building on Long Island175, though it remains abandoned. While conditions at the station have improved, they have never risen back to where they were before World War I and the Great Depression or the 1960s transit decline. There have continued to be incidents of violent crime through the 2000s177 and residents have reported persisting filthy conditions and rampant vagrancy178. One the other hand, there have been increases in service, such as in 2007 due to growing ridership179, and more recently Freeport has seen a slightly higher frequency of service than it did even at its former peak in the early 1950s, though it should also be noted that the population today is higher. The above is a selection of timetables from 1899 to 2014, showing how their design has changed over time. The 2014 schedule courtesy of the family of Denzil Rushton, and the one from 1899 is from the July 28th Nassau County Review, NYS Historic Newspapers. The following artifacts are on loan to the museum from the family of Denzil Rushton. Founded in 1863, the Brotherhood of Locomotive Engineers and Trainmen, or BLET, is a union of rail employees on various railroads throughout the United States, including the Long Island Railroad, and is affiliated with the International Brotherhood of Teamsters180. 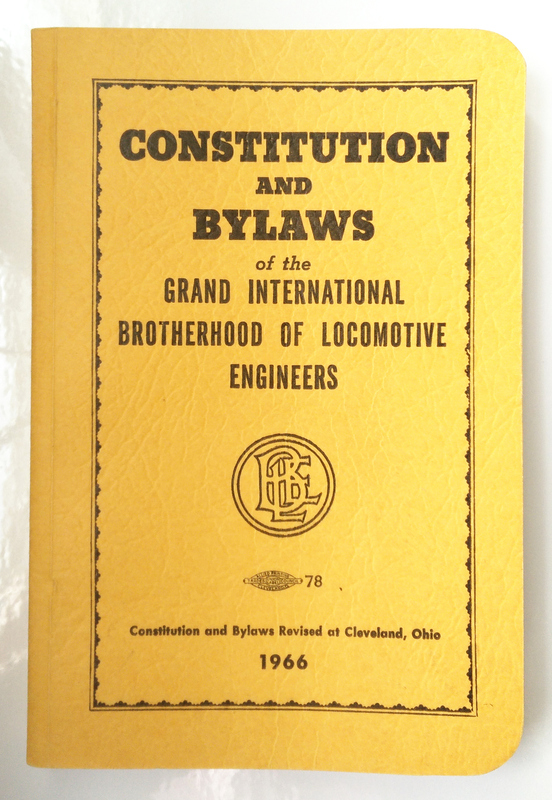 These 1966 (first) and 1991 (second) handbooks from the union, at the time known as the Grand International Brotherhood of Locomotive Engineers, or BLE, provided an extensive reference for members. Among the topics they laid out were membership requirements, the union hierarchy, rules concerning voting, disciplinary measures, and striking. They also urged members to keep up on their dues. The versions got thicker over years, despite remaining similar in overall appearance. 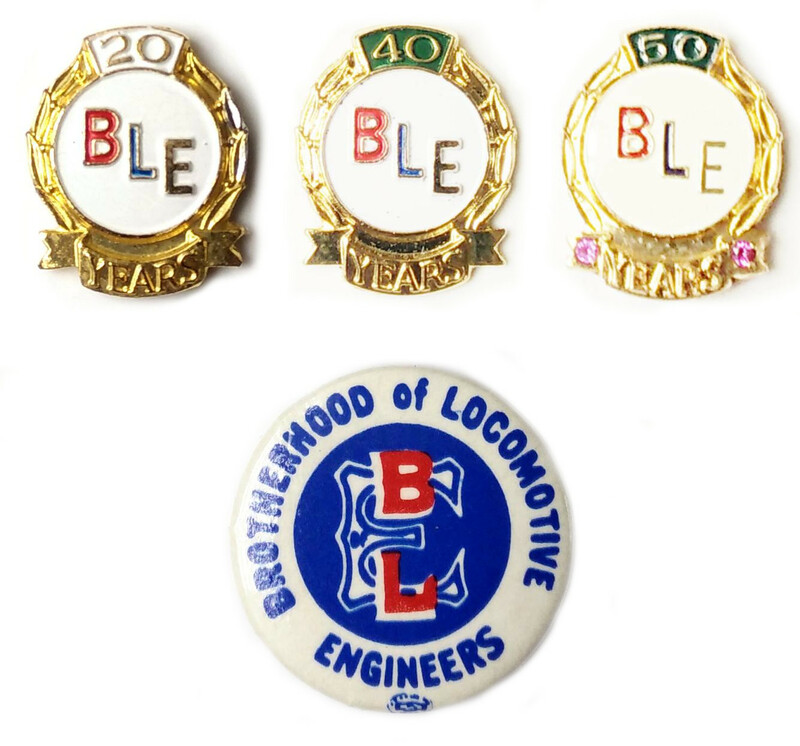 From left to right on top are pins commemorating 20, 40, and 50 years respectively of membership in the BLE. Beneath them is a button with the union's logo. 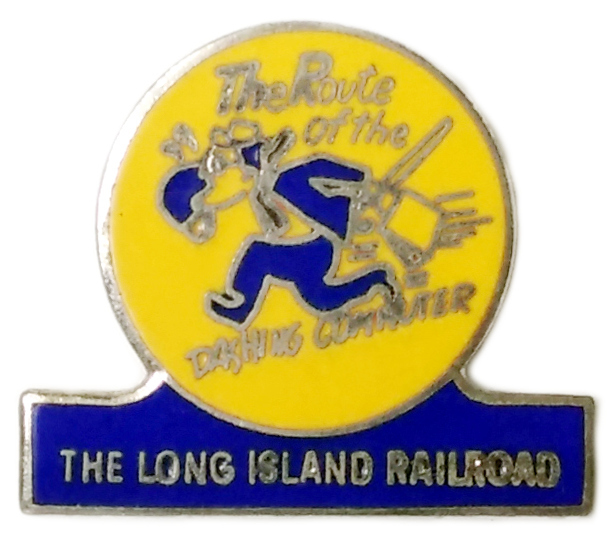 This pin features Dan, the dashing commuter181, who was used as a Long Island Railroad logo182 leading up to the takeover by the MTA. It would not fit in well today with the MTA's warnings not to run on the platforms. 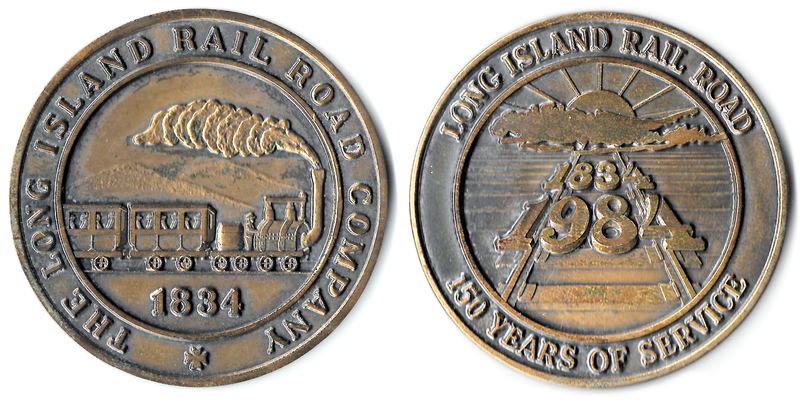 This bronze medal was issued to commemorate the 150th anniversary of the Long Island Railroad in 1984. The obverse shows the LIRR's original company seal, while the reverse lists its years of operation under an image of Long Island183. Providing much more extensive information than the timetables distributed to the general public, this booklet from 1966 was intended for the employees operating the railroad infrastructure. It includes detailed system-wide timetables, transfer times, and fare schedules. It also provides information on switches, signals, and other equipment, as well as policies, regulations, and troubleshooting guidelines. This 1966 booklet provided detailed timing information, train assignments, and track mileage statistics, among other information. Long Island Rail Road Rules of the Operating Dept. 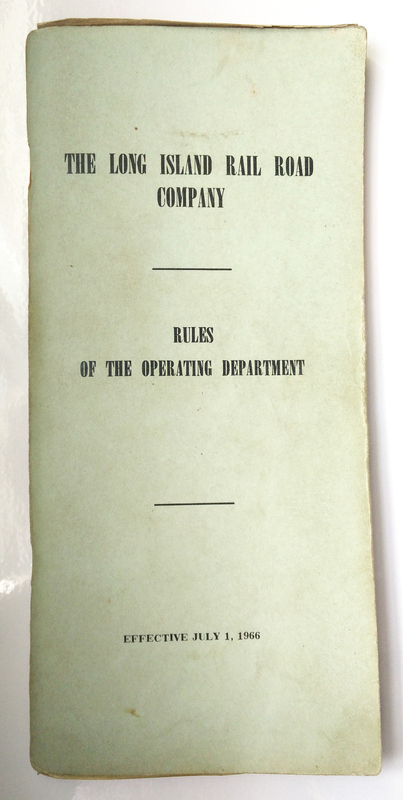 This is a 1966 handbook for operating dept. employees. It was technically not given to them but provided on loan, warning on the first page that they had to return it on demand or pay $1.00. It covered many of the Long Island Railroad's operating policies, such as the responsibilities of different crew members, train operations, and signaling. For linked PDF files, page numbers are given as those in the PDF, not the original document. Andersen, Robert W. "Early History of the LIRR." Long Island Rail Road History Website. 11/17/2007. Seyfried, Vincent F. The Long Island Rail Road: A Comprehensive History. "Part One: South Side R.R. of L.I." 1961. p. 1 Wikisource. Andersen, Robert W. Early History of the LIRR." Long Island Rail Road History Website. 11/17/2007. Andersen, Robert W. "Old Tickets." Long Island Rail Road History Website. 11/17/2007. Andersen, Robert W. "Early History of the LIRR" and "LIRR Timeline." Long Island Rail Road History Website. 11/17/2007 and 11/29/2003. Ross, Peter. "History of the Long Island Railroad." 1903. Long Island Railroad History Page. The Dunton Archive. Andersen, Robert W. "Early History of the LIRR." Long Island Rail Road History Website. 11/17/2007; Seyfried, Vincent F. The Long Island Rail Road: A Comprehensive History. "Part One: South Side R.R. of L.I." 1961. p. 1 Wikisource. Seyfried, Vincent F. The Long Island Rail Road: A Comprehensive History. "Part One: South Side R.R. of L.I." 1961. p. 2 Wikisource. Andersen, Robert W. "Early History of the LIRR." Long Island Rail Road History Website. 11/17/2007; Ross, Peter. "History of the Long Island Railroad." 1903. Long Island Railroad History Page. The Dunton Archive; The Long Island Railroad: 100th Anniversary. The Osborne Company. 1934. p. 2 Freeport Historical Society collection. The Long Island Railroad: 100th Anniversary. The Osborne Company. 1934. p. 12 Freeport Historical Society collection. Andersen, Robert W. "Early History of the LIRR." Long Island Rail Road History Website. 11/17/2007; Ross, Peter. "History of the Long Island Railroad." 1903. Long Island Railroad History Page. The Dunton Archive. Andersen, Robert W. "LIRR Timeline." Long Island Rail Road History Website. 11/29/2003. Seyfried, Vincent F. The Long Island Rail Road: A Comprehensive History. "Part One: South Side R.R. of L.I." 1961. p. 17 Wikisource. "Tnat Time-Table." Nassau County Review. 11/15/1907. p. 1; "The Stroller." South Side Messenger. 7/22/1910. ; "The Commuters Complaint." Nassau County Review. 12/13/1912. p. 1; "Will Carry Fight for Reduced Fares to Appellate Court." The Nassau Post. 7/18/1914. p. 1 NYS Historic Newspapers. Seyfried, Vincent F. The Long Island Rail Road: A Comprehensive History. "Part One: South Side R.R. of L.I." 1961. pp. 2, 8 Wikisource. Andersen, Robert W. "The South Side RR of LI." Long Island Rail Road History Website. 11/18/2007. Seyfried, Vincent F. The Long Island Rail Road: A Comprehensive History. "Part One: South Side R.R. of L.I." 1961. p. 30 Wikisource. Zimmerman, Charles J. "A view from the archives." The Leader. 7/11/1991 p. 8 NYS Historic Newspapers. Andersen, Robert W. "The South Side RR of LI." Long Island Rail Road History Website. 11/18/2007. ; Seyfried, Vincent F. The Long Island Rail Road: A Comprehensive History. "Part One: South Side R.R. of L.I." 1961. pp. 4-5 Wikisource. Zimmerman, Charles J. "A view from the archives." The Leader. 7/11/1991 p. 8 NYS Historic Newspapers. ; Seyfried, Vincent F. The Long Island Rail Road: A Comprehensive History. "Part One: South Side R.R. of L.I." 1961. p. 14 Wikisource. Seyfried, Vincent F. The Long Island Rail Road: A Comprehensive History. "Part One: South Side R.R. of L.I." 1961. p. 14 Wikisource. Ibidp. 5; Ross, Peter. "History of the Long Island Railroad." 1903. Long Island Railroad History Page. The Dunton Archive; Andersen, Robert W. "LIRR Timeline." Long Island Rail Road History Website. 11/29/2003. Seyfried, Vincent F. The Long Island Rail Road: A Comprehensive History. "Part One: South Side R.R. of L.I." 1961. p. 12 Wikisource. Andersen, Robert W. "The South Side RR of LI." Long Island Rail Road History Website. 11/18/2007; Seyfried, Vincent F. The Long Island Rail Road: A Comprehensive History. "Part One: South Side R.R. of L.I." 1961. pp. 9, 18 Wikisource. The Long Island Railroad: 100th Anniversary. The Osborne Company. 1934. p. 11 Freeport Historical Society collection. Seyfried, Vincent F. The Long Island Rail Road: A Comprehensive History. "Part One: South Side R.R. of L.I." 1961. p. 15 Wikisource. Seyfried, Vincent F. The Long Island Rail Road: A Comprehensive History. "Part One: South Side R.R. of L.I." 1961. pp. 15-16 Wikisource. "Early Morning Pick-up is Started Monday." The Leader. 10/22/1953. p. 4 NYS Historic Newspapers. Seyfried, Vincent F. The Long Island Rail Road: A Comprehensive History. "Part One: South Side R.R. of L.I." 1961. pp. 6, 14 Wikisource. Keller, Dave. "L.I.R.R. Telegraphic Call Letters." Long Island Rail Road History Website. 3/6/2003. Andersen, Robert W. "Towers." Long Island Rail Road History Website. 8/27/2006. Seyfried, Vincent F. The Long Island Rail Road: A Comprehensive History. "Part One: South Side R.R. of L.I." 1961. pp. 19-21 Wikisource. Ross, Peter. "History of the Long Island Railroad." 1903. Long Island Railroad History Page. The Dunton Archive; The Long Island Railroad: 100th Anniversary. The Osborne Company. 1934. p. 13 Freeport Historical Society collection. Seyfried, Vincent F. The Long Island Rail Road: A Comprehensive History. "Part One: South Side R.R. of L.I." 1961. p. 26 Wikisource. Seyfried, Vincent F. The Long Island Rail Road: A Comprehensive History. "Part One: South Side R.R. of L.I." 1961. p. 22 Wikisource. "Be Magnanimous." The Leader. Grade Crossing Elimination scrapbook. Freeport Historical Society collection; Seyfried, Vincent F. The Long Island Rail Road: A Comprehensive History. "Part One: South Side R.R. of L.I." 1961. p. 1 Wikisource. "Freeport Historical Society remembers 'TR.'" The Leader. 12/18/2008. p. 6 NYS Historic Newspapers. Andersen, Robert W. "The Early Pennsylvania RR Years." Long Island Rail Road History Website. 3/18/2008; Ross, Peter. "History of the Long Island Railroad." 1903. Long Island Railroad History Page. The Dunton Archive. "Fighting for Our Lives." Nassau County Review. 3/12/1920. p. 8 NYS Historic Newspapers. Seyfried, Vincent F. New York & Long Island Traction Company. 1952. pp. 35-36 The Internet Archive. "LIRR Forestalls Action." The Long Island Farmer. 8/8/1902. NYS Historic Newspapers. Metz, Clinton E. "Freeport of Yester-Year." Freeport Historical Society collection. "Freeport News." Nassau County Review. 9/2/1910. p. 1 NYS Historic Newspapers. The Long Island Railroad: 100th Anniversary. The Osborne Company. 1934. p. 15 Freeport Historical Society collection. Huneke, Arthur John. 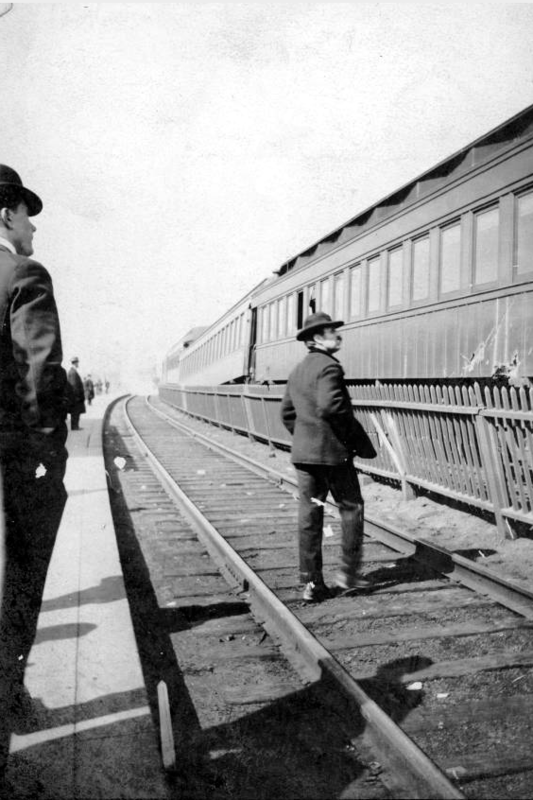 "One Hundred Years: The Long Island Rail Road." Arrt's Arrchives. Kornfeld, Michael. "L.I.R.R. Main Line to Enter Electric Age." The New York Times. 1/17/1988. Infotrac Newsstand. "The LIRR 'Extra' List." TrainsAreFun. 10/14/2017. "The End of Steam Locomotives on the Long Island Railroad." Exhibit in the waiting room of the Hicksville LIRR station, Hicksville, NY., viewed on 8/25/17. Beitler, Stu. "Richmond Hill, NY Passenger Trains Collide Nov 1950." GenDisasters. "Police News." The Leader. 1/18/1996. p. 7 NYS Historic Newspapers. "One unlucky guy and two unlucky girls." The Leader. 8/17/2006. p. 4 NYS Historic Newspapers. "Fourteen Thousand Commuters." Nassau County Review. 7/8/1910. p. 1 NYS Historic Newspapers. "More Commuters." Nassau County Review. 8/6/1920. p. 2 NYS Historic Newspapers. "By the Fifteen Cent Line." The Nassau Post. 6/6/1914. p. 1 NYS Historic Newspapers. "Crowded Trains Draw Protests of 2 Organizations." The Leader. 8/17/1941. NYS Historic Newspapers. Andersen, Robert W. "Maps of the LIRR" and "State Hospital Spurs." Long Island Rail Road History Website. 1/17/2014 and 1/29/2014. The Long Island Rail Road. Maps of Freight Stations & Private Sidings. October 1978. p. 21. "Ask $10,000 Each for Injuries" and "Teamster Killed at Freeport." The Long Island Farmer. 12/25/1908. ; "Train Hit Christmas Trees." The Suffolk County News. 12/15/1911. ; "Two Killed at LIRR Crossing." The Evening Enterprise, Pokepsie, NY. 9/13/1912. p. 1; "Another Railroad Tragedy." Nassau County Review. 9/13/1912. p. 1; "Train Hits Auto." Nassau County Review. 1/9/1920. p. 1. NYS Historic Newspapers. "Report Low Bidders." The Medina Daily Journal-Register. 1/31/1958. p. 4; "Woman Injured by Train Sues L.I.R.R. for $900,000." The Leader. 11/27/1958. p. 7 NYS Historic Newspapers. "Start of Crossing Project Hinges on Korea." Nassau Daily Review Star. 8/18/1950. Grade Crossing Elimination scrapbook. Freeport Historical Society collection. "Of Interest to the General Public." Nassau County Review. 7/24/1914. NYS Historic Newspapers. Gaynor, Roger. "Freeporter remembers Village of the 1920s." The Leader. 7/8/1993. p. 3 NYS Historic Newspapers. "L.I.R.R. Business." Nassau County Review. 7/23/1909. NYS Historic Newspapers. "Two Killed at LIRR Crossing." The Evening Enterprise. 9/13/1912. p. 1 NYS Historic Newspapers. "L.I.R.R. Declines to Join Campaign." The Nassau Post. 8/8/1914. p. 1 NYS Historic Newspapers. "Ask Co-operation." The Nassau Post. 5/19/1916. p. 4. NYS Historic Newspapers. Schofer, Laura. "Fatality at Freeport Station." The Leader. 4/14/2016. p. 1 NYS Historic Newspapers. "Board Submits Grade Elimination Problems to Public Before Preparing Case for P.S.C." The Leader. 6/15/1949. Grade Crossing Elimination scrapbook. Freeport Historical Society collection. "Oppose Plan to Shift Depot at Freeport." Newsday. 7/6/1949. Grade Crossing Elimination scrapbook. Freeport Historical Society collection. "Board to Seek 'Incidentals' in Grade Projects." The Leader. 2/15/1945. Grade Crossing Elimination scrapbook. Freeport Historical Society collection. ; Report to the Village Board on the Midtown Plan. 2/8/1945. p. 1 Freeport Historical Society collection. "Don't Help Throttle Freeport." The Leader. 1/20/1949. Grade Crossing Elimination scrapbook. Freeport Historical Society collection. ; "Grade Elimination." The Leader. 2/7/1946. p. 4 NYS Historic Newspapers. Report to the Village Board on the Midtown Plan. 2/8/1945. p. 1 Freeport Historical Society collection. "Latest Grade Elimination Plan Endorsed by Atlantic-South, Northwest Civic Associations." The Leader. 12/9/1948. Grade Crossing Elimination scrapbook. Freeport Historical Society collection. "Plan of Public Improvements – Midtown Business Section." 7/1/1944. Grade Crossing Elimination scrapbook. Freeport Historical Society collection. "Be Magnanimous." The Leader. Grade Crossing Elimination scrapbook. Freeport Historical Society collection. "Be Magnanimous, The Leader; Village Board members Hopeful Mid-Town Plan Will Win Approval." The Leader. 12/7/1944. Grade Crossing Elimination scrapbook. Freeport Historical Society collection. "Freeport Gets Postwar Plan after Survey." Nassau Daily Review Star. 11/21/44. Grade Crossing Elimination scrapbook. Freeport Historical Society collection. "Strecker Shows Plaza Would Benefit Village." The Leader. 12/14/1944. ; "Malone Cites Penn Station as Cure for Slum District." The Leader. February 1946. Grade Crossing Elimination scrapbook. Freeport Historical Society collection. "Don't Menace Northeast Realty Values." The Leader. 2/10/1949. Grade Crossing Elimination scrapbook. Freeport Historical Society collection. Report to the Village Board on the Midtown Plan. 2/8/1945. ; Koetzner Midtown Plan rendering. Freeport Historical Society collection. "Board Submits Grade Elimination Problems to Public Before Preparing Case for P.S.C." The Leader. 6/15/1949. ; "Don't Menace Northeast Realty Values." The Leader. 2/10/1949. Grade Crossing Elimination scrapbook. Freeport Historical Society collection. "Board Submits Grade Elimination Problems to Public Before Preparing Case for P.S.C." The Leader. 6/15/1949. ; "Don't Help Throttle Freeport." The Leader. 1/20/1949. Grade Crossing Elimination scrapbook. Freeport Historical Society collection. "Be Magnanimous." The Leader; "Village Board members Hopeful Mid-Town Plan Will Win Approval." The Leader. 12/7/1944. Grade Crossing Elimination scrapbook. Freeport Historical Society collection. "R.R. Crossing Plan Session Stormy at Exchange Club." Nassau Daily Review Star. 4/24/1949. Grade Crossing Elimination scrapbook. Freeport Historical Society collection. Andrews, Larry. "100,000 Affected By Freeport Grade Crossing Dispute." Nassau Daily Review Star. 2/24/1949. Grade Crossing Elimination scrapbook. Freeport Historical Society collection. "Board Submits Grade Elimination Problems to Public Before Preparing Case for P.S.C." The Leader. 6/15/1940. Grade Crossing Elimination scrapbook. Freeport Historical Society collection. "Grade Elimination." The Leader. 2/7/1946. p. 4 NYS Historic Newspapers. "Changes Needed, Strecker Warns." Nassau Daily Review Star. 12/15/1944; Hanning, Leo P. "Depot Site, Slum Clearance, Issues Snag Freeport Plans." Newsday. 12/2/1944. Grade Crossing Elimination scrapbook. Freeport Historical Society collection. "Village Board members Hopeful Mid-Town Plan Will Win Approval." The Leader. 12/7/1944. ; "Plan of Public Improvements – Midtown Business Section." 7/1/1944. ; "Moses Backs Fight For Parking Field at Freeport Depot." Nassau Daily Review Star. 6/17/1949. Grade Crossing Elimination scrapbook. Freeport Historical Society collection. "Latest Grade Elimination Plan Endorsed by Atlantic-South, Northwest Civic Associations." The Leader. 12/9/1948. ; "Board Submits Grade Elimination Problems to Public Before Preparing Case for P.S.C." The Leader. 6/15/1949. Grade Crossing Elimination scrapbook. Freeport Historical Society collection. "Crossing Plan at Freeport Snarled More." Nassau Daily Review Star. 5/25/1949. ; "L.I.R.R. and D.P.W. Won't Oppose Grade Elimination Plans." The Leader. 11/10/1949. Grade Crossing Elimination scrapbook. Freeport Historical Society collection. Report to the Village Board on the Midtown Plan. 2/8/1945. Freeport Historical Society collection. "Oppose Plan to Shift Depot at Freeport." Newsday. 7/6/1949. ; Andrews, Larry. "Baldwin-Freeport Grade Crossing Work At Standstill: Plans are Held Up By Factional Dispute." Nassau Daily Review Star. 3/25/1949. Grade Crossing Elimination scrapbook. Freeport Historical Society collection. Andrews, Larry. "Public Records Kept Secret by Freeport Village Board." Nassau Daily Review Star. 2/29/1949. Grade Crossing Elimination scrapbook. Freeport Historical Society collection. "Oppose Plan to Shift Depot at Freeport." Newsday. 7/6/1949. ; "PSC Minutes May Decide Station Fight." Nassau Daily Review Star. 11/22/1949. Grade Crossing Elimination scrapbook. Freeport Historical Society collection. Andrews, Larry. "Baldwin-Freeport Grade Crossing Work At Standstill: Plans are Held Up By Factional Dispute." Nassau Daily Review Star. 3/25/1949. ; "Crossing Plan at Freeport Snarled More." Nassau Daily Review Star. 5/25/1949. "Chamber to Seek New Bus Route to Hofstra College." The Leader. 12/2/1948. p.1 NYS Historic Newspapers. "Northwest Civic Vote On Grade Elimination 'Plan 3' Results in Tie." The Leader. 11/5/1948. Grade Crossing Elimination scrapbook. Freeport Historical Society collection. Strecker, Henry. "Village Waits PSC Ruling On Station." Nassau Daily Review Star. 2/15/1950. Grade Crossing Elimination scrapbook. Freeport Historical Society collection. "Revised Grade Elimination Plan Would Save Village $1,000,000 Strecker Thinks." The Leader. 12/23/1948. Grade Crossing Elimination scrapbook. Freeport Historical Society collection. "Freeport Gets Postwar Plan after Survey." Nassau Daily Review Star. 11/21/1944. Grade Crossing Elimination scrapbook. Freeport Historical Society collection. "Strecker Shows Plaza Would Benefit Village." The Leader. 12/14/1944. ; "Freeport Drafts Post-War Scheme." New York Times. 11/23/1944. Grade Crossing Elimination scrapbook. Freeport Historical Society collection. "L.I.R.R. and D.P.W. Won't Oppose Grade Elimination Plans." The Leader. 11/10/1949. Grade Crossing Elimination scrapbook. Freeport Historical Society collection. "Village Board members Hopeful Mid-Town Plan Will Win Approval." The Leader. 12/7/1944. Grade Crossing Elimination scrapbook. Freeport Historical Society collection. "Assembly Bill Ends P.S.C. Control of Grade Elimination." The Leader. 2/8/1945. Grade Crossing Elimination scrapbook. Freeport Historical Society collection. Report to the Village Board on the Midtown Plan. 2/8/1945. p. 11 Freeport Historical Society collection. "Cohen Grade Elimination Plan Involved $175,000 for Paving Costs." The Leader. 4/14/1949. Grade Crossing Elimination scrapbook. Freeport Historical Society collection. "Grade Elimination." The Leader. 2/7/1946. p. 4 NYS Historic Newspapers. ; "Board to Seek 'Incidentals' in Grade Projects." The Leader. 2/15/1945. Grade Crossing Elimination scrapbook. Freeport Historical Society collection. "Board Submits Grade Elimination Problems to Public Before Preparing Case for P.S.C." The Leader. 6/15/1949. ; "Crossing Plan at Freeport Snarled More." Nassau Daily Review Star. 5/25/1949. Grade Crossing Elimination scrapbook. Freeport Historical Society collection. "Grade Elimination Plans Now in Hands of P.S. Commission." The Leader. 1/12/1950. Grade Crossing Elimination scrapbook. Freeport Historical Society collection. "PSC Minutes May Decide Station Fight." Nassau Daily Review Star. 11/22/1949. Grade Crossing Elimination scrapbook. Freeport Historical Society collection. "Construction of the Elevated Tracks." New York Heritage Digital Collections. 8/8/2011. "Strecker Shows Plaza Would Benefit Village." The Leader. 12/14/1944. Grade Crossing Elimination scrapbook. Freeport Historical Society collection. "PSC Okays $6,000,000 Freeport Grade Crossing Elimination Plan." Newsday. 7/20/1950. Grade Crossing Elimination scrapbook. Freeport Historical Society collection. "Freeport Drafts Post-War Scheme." New York Times. 11/23/1944. Grade Crossing Elimination scrapbook. Freeport Historical Society collection. "Long Island Rail Road." Wikipedia. 8/31/2017. Andersen, Robert W. "Better Rail Service for Nassau County." Long Island Rail Road History Website. 1/12/2014. Monahan, Sharon. "Commuter Car Areas Due to Rise." The New York Times. 1/29/1989. Infotrac Newsstand. "LIRR Station Robber Caught." The Leader. 11/28/1985. p. 1; "Neighbor Helps Police Catch Suspect." The Leader. 8/27/1981. p. 13 NYS Historic Newspapers. "Cops Continue to Make Arrests." The Leader. 9/15/1983. p. 5; "Marijuana Arrests." The Leader. 6/6/1985. p 9 NYS Historic Newspapers. "Six Youths Nabbed in Sunday Crime." The Leader. 7/20/1978. p. 5; "Freeport Police Have Busy Twelve Hours." The Leader. 10/15/1981. p. 3 NYS Historic Newspapers. "Police Officers Honored by Kiwanis for Speedy Captures." The Leader. 1981-04-30. p. 1; "Neighbor Helps Police Catch Suspect." The Leader. 8/27/1981. p. 13; "Man Robbed Waiting for Train" The Leader. 9/1/1983. p. 16; "Mugging at railroad station." The Leader. 8/10/1989. p. 2; "Police News." The Leader. 8/23/1990. p. 2; "Police News." The Leader. 8/3/1990. p. 2 NYS Historic Newspapers. "Freeport LIRR Fights Graffiti at Station." 5/271982. The Leader. p. 13 NYS Historic Newspapers. "L.I.R.R. Planning To Drop 60 Trains." 11/18/1990. The New York Times. Infotrac Newsstand. Lyall, Sarah. "L.I.R.R. Planning To Eliminate 41 Trains." The New York Times. 3/6/1991. Infotrac Newsstand. "LIRR cuts, power issue are board topics." The Leader. 11/29/1990. p. 3 NYS Historic Newspapers. Firestone, David. "L.I.R.R. Strike: The Scene; Some Inconvenience, but No Chaos." The New York Times. 7/18/1994. Infotrac Newsstand. "Freeport Election." The Leader. 3/10/1983. p. 7 NYS Historic Newspapers. "Rehab for LIRR Rails." The Leader. 7/2/1981. pp. 1, 12 NYS Historic Newspapers. "Baldwin and Freeport LIRR Stations Hit by Purcell" The Leader. 11/5/1981 pp. 1, 7. NYS Historic Newspapers. "Freeport LIRR Fights Graffiti at Station" The Leader. 5/27/1982. p. 13 NYS Historic Newspapers. Mole, Peter. "Happy 100th Birthday, Great Gram!" The Leader. 8/2//2001. p 8 NYS Historic Newspapers. "Freeport Mayor Andrew Hardwick's War on Crime" The Leader. 5/14/2009 p. 10 NYS Historic Newspapers. Castillo, Alfonso A. "LIRR to replace last 6 of aging escalators." Newsday. 5/19/2012. Infotrac Newsstand. Paquette, Carole. "Freeport Plans Downtown Revitalization Work." The New York Times. 3/7/2002. Infotrac Newsstand. "LIRR Returns with Modified Scheduling." The Leader. 11/15/2012. p. 6 NYS Historic Newspapers. "Police News." The Leader. 2005-06-16. p. 8; "Assault averted at Freeport LIRR." The Leader. 7/10/2008 p. 2; "Robbery arrest in Freeport." The Leader. 4/2/2009. p. 6; "Robbery in Freeport." The Leader. 7/2/2016. p. 7 NYS Historic Newspapers. Nappi, Diana. 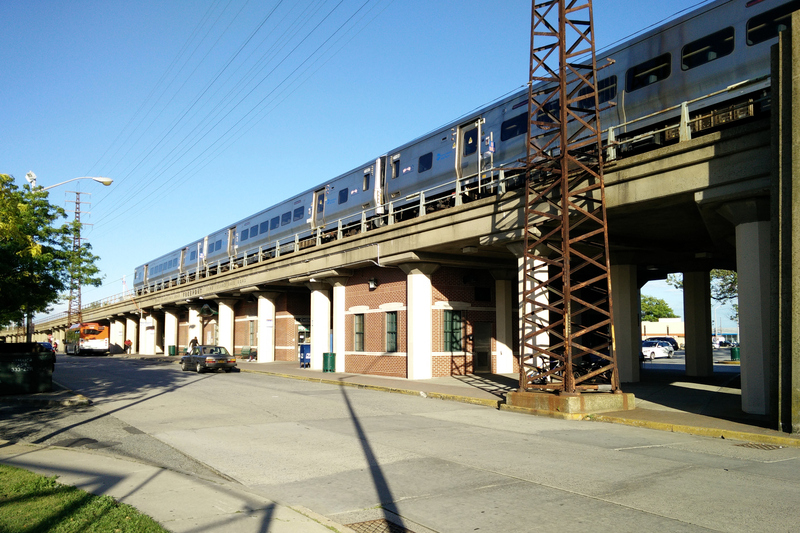 "Clean up Freeport train station: a letter to MTA officials." The Leader. 5/15/2014 p. 7; "Keep Freeport's train station clean!" The Leader. 3/19/2015. p. 3 NYS Historic Newspapers. "Nautical Festival parking." The Leader. 5/21/2007. p. 4 NYS Historic Newspapers. 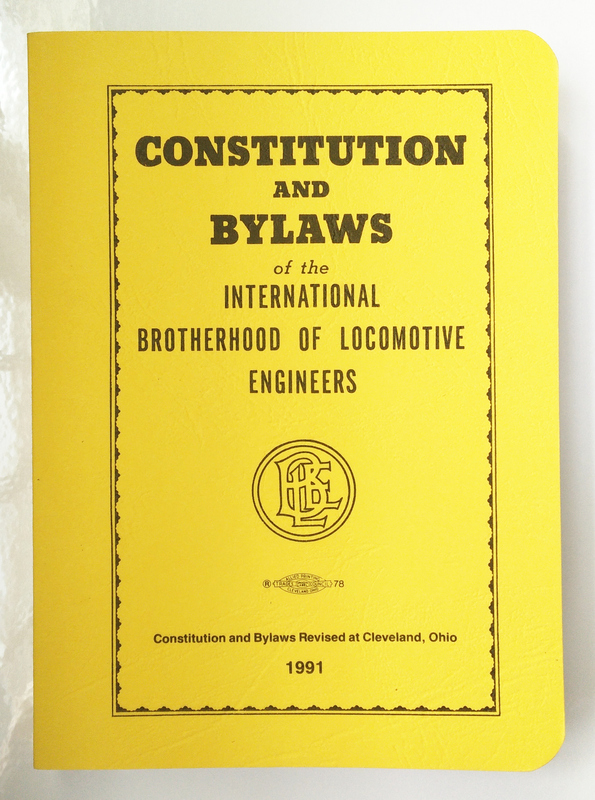 Brotherhood of Locomotive Engineers and Trainmen. "About the BLET." Andersen, Robert W. "Maps of the LIRR." Long Island Rail Road History Website. 1/17/2014. Andersen, Robert W. Long Island Rail Road History Website. 1/17/2014.